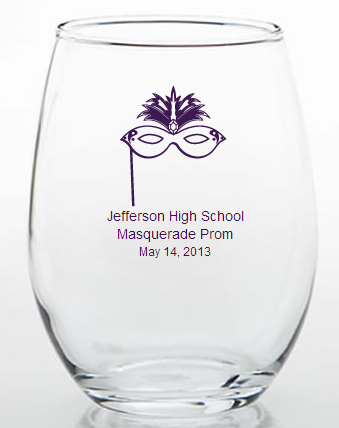 Our masquerade party favors allow your guests to take home a piece of the party with them at the end of the night. The stemless design is a wonderful way to avoid knocking over top-heavy glasses or breaking that fragile stem. Don't overlook the possibilities of presentation with such a unique favor- instead of simply handing them over to your guests, use them to serve a perfectly portioned out dessert like elegant chocolate mousse, or creamy tiramisu. Each glass measures 3.75 inches tall and 2.5 inches in diameter, and has a 9 ounce capacity. 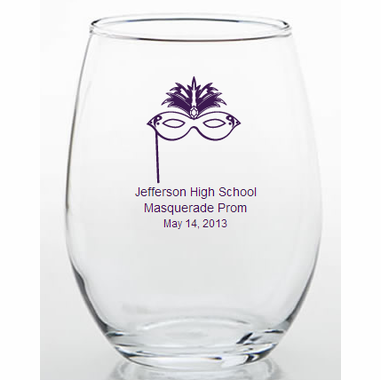 Made in the USA, these wine glass favors come bulk packed. Boxes are available for an additional .70 each. They are shipped flat for you to package your glasses.